Creep, shrinkage and durability of concrete and concrete structures have been a traditional conference topic for almost fifty years. 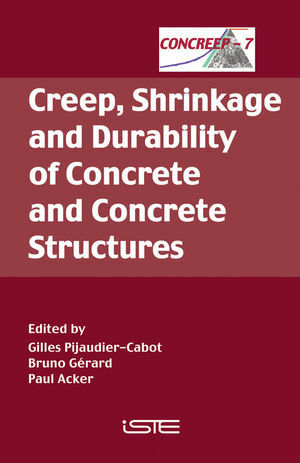 This volume contains contributions from presentations at CONCREEP – 7, held September 12th – September 14th, 2005 at Ecole Centrale de Nantes, France. These papers cover the latest results and implementation strategies of creep, shrinkage and durability mechanics research at the interface of solid mechanics, materials science, experimental mechanics, and computational mechanics of concrete-like materials, and the related structural engineering problems. Gilles Pijaudier-Cabot is a Professor at Ecole Centrale de Nantes, France. Bruno Gérard is a researcher at OXAND, France. Paul Acker is a researcher at Lafarge, France. Micromechanisms and micromechanics of creep and shrinkage. Multiphase and multiscale approaches to creep, shrinkage and durability. Size effect in concrete creep, shrinkage and durability. Core properties of early-age concrete. Deterioration kinetics of concrete structures in aggressive environments. Monitoring the durability performances of concrete structures. Large-scale monitoring of creep, shrinkage and cracking of structures. Model-based monitoring of cracking and durability in early-age structures. Creep and shrinkage of new concrete products. Shrinkage reducing methods and agents. Uncertainty and probabilistic modeling of creep and durability.